Suitable for all skin types and contains no chemicals or bleaching agents. Vinies Luminous Mask is gentle enough to use daily and in combination with Vinies Instant Face Lift Mask and Vinies Pearl White Skin Lightening Mask as part of a comprehensive beautifying skin care regime. 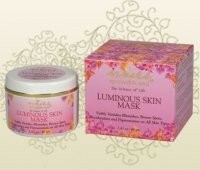 Vinies Luminous Skin Mask was created with rare and pure herbs such as Licorice Root Extract, Tamarind, Brahmi, Orange Fruit Extract, Bearberry Leaf Extract, Magnolia Extract, Mint Leaf Extract, Primrose Flower Extract, Lemon Balm Leaf Extract, Millefoil Flower Extract, Indian Sandalwood Oil, Indian Narcissus Oil and Indian Rose Oil. I was sent 2 generous samples of this,the colour is a brown grainy condsistancy,it smells really herby which i dont think will be to everybody's taste. i applied to my cleansed face and it started stinging slightly but this does sometimes happen with me so i perservered. after 10 minutes i rinsed and my face felt very firm and plumped but very red although not stinging at all once i had rinsed the mask off. over night the redness went and i woke up to soft and clean feeling skin. i would use this again but am a little scared at the redness it causes initially. "I was sent 2 generous samples of this,the colour is a brown grainy condsistancy,it smells really herby which i dont think will be to everybody's..."